Let's be honest. Coffee table books are for aesthetic pleasure. Sure, they are fun to read and flip through, but only as a secondary purpose. Their primary purpose is decoration, of course! I am always drawn to vignettes that include interesting coffee table books, and today I wanted to share 5 of my favorites. 1.) Jamie Meares, of Furbish Studio and iSuwannee, never fails to create playful, bold spaces full of color and pattern. The next 2 vignettes were designed by her. I love this stack of coffee table books she stores on top of a stool, with an antique bust as a topper. The look feels very relaxed and strewn together, yet oh so chic. Talk about a delicious coffee table. A leopard tray with stacks of books, jewels, and flowers looks perfectly lived in and curated at the same time. 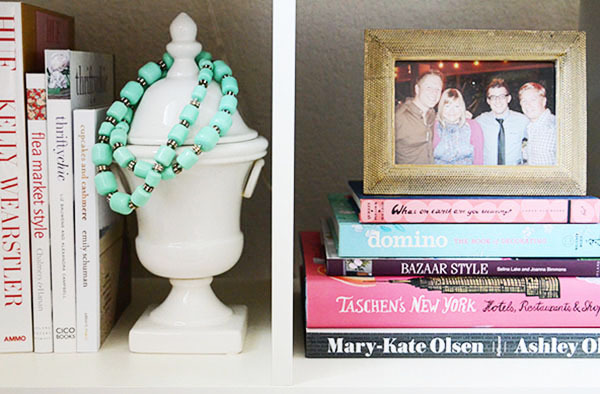 Kelly of Fabulous K shared her office yesterday on La Dolce Vita. The femininity and playfulness of her office made me long for a place of my own to get creative. What I really loved was her shelves full of mementos and photos, as well as pretty coffee table books. That Tashen's New York book has been on my list for some time now. How gorgeous are the colors in her shelves? L'Wren Scott shared her Paris escape that she shares with Mick Jagger in Vogue last April- and what had me gawking was, you guessed it, her coffee table. The vintage books hold sentimental value for her, and the costume mask layed across them here gives off a very Parisian feel. 5.) 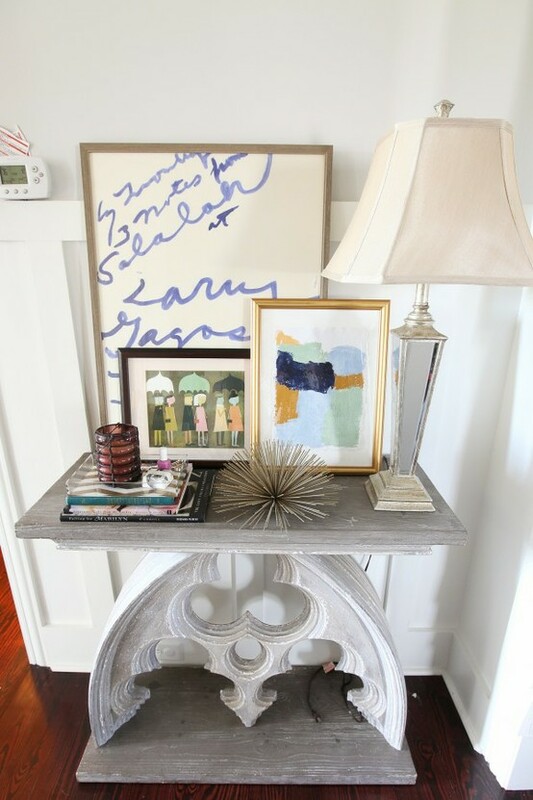 Chassity Evans of Look Linger Love created a gorgeous vignette in her entryway. Although she did utilize coffee table books in the mix, it's really the artwork that draws my eye. I love that she chose to lay three pieces grouped together against the wall, rather than hanging them up. It gives a relaxed, curated vibe to the space, don't you think? Do you love them as much as me? Honestly, I could stare at these 5 all day. Love them all!! I need to stock up on books now that I live in a house and not an apartment. Thanks for the inspiration! I'm with you, Sam! Love the book vignettes. The layering of the special things makes me want to savor them! Love the necklace on the bust and the mask. I loooove coffee table books. I'm currently trying to refresh my collection thanks to Amazon. Love these. My book collection is below average and something I desperately need to work on! As much as I love all parts of interior design, I find myself most interested in the way people decorate their "little" spaces--the coffee table or shelf that you might not notice right away. I love the pictures you pulled for inspiration! These are all so pretty! I especially love the last one. P.S. Make sure to check out the giveaway that The Now and Swirl are hosting. It's for a $50 J. Crew gift card. YES YES YES! i am always inspired by beautiful vignettes that i see online, especially gorgeous offices! i can't wait to design my own one day! & LOVE your blog! you are adorable. I'm so with ya...it really makes me wish that all my spaces looked that lovely! But dang it if it doesn't take a lot of work and a good eye to get it done!!! Love all these gals though and they really know how to work it! Pretty much obsessed with coffee table books. Love all of these! 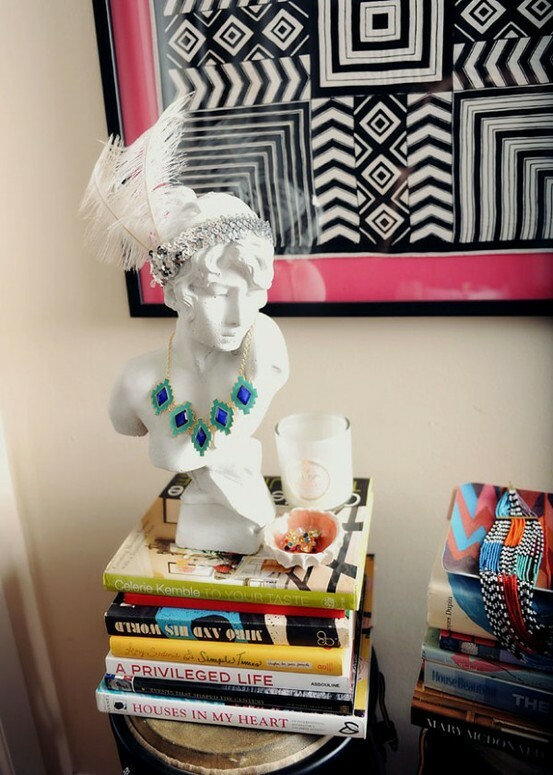 Loving all these ideas...i also have a bust where i use in a similar style, but it no longer fits in my nyc apt... so it stored away :( I may sell it i think!